Throughout history, white décor has been a mainstay, so building a collection of these versatile vintage pieces is easy. KariAnne Wood of Thistlewood Farms shares her secrets to creating divine displays with white ware, but her inspiring ideas will work with any color or pattern you choose. 1. Group a collection of similar items for maximum impact. 2. When styling items on a shelf, always add a platter in back to add height to your display. 3. Don’t overlook utilitarian items when displaying items. One of my favorite collections is my display of milk-glass mixing bowls. 4. Always remember that odd groupings of items are more pleasing to the eye. 5. To create visual interest, introduce elements of nature, like nests or branches or acorns. 6. Use a soft-gray wall as the perfect backdrop to open shelving displays. For more “pop,” stack white dishes and bowls against a bright or dark background. The contrast makes the dishes look like pieces of artwork. 7. For an elegant display, add a grouping of crystal or glass mixed with white dishes. 8. Highlight one special piece on your collection by featuring it under a cloche and on a rustic platter. 9. Add height to a display by stacking dishes and bowls. Use a smaller bowl under a plate to create an instant stand. 10. Have fun with your collections. Don’t wait for a special occasion. 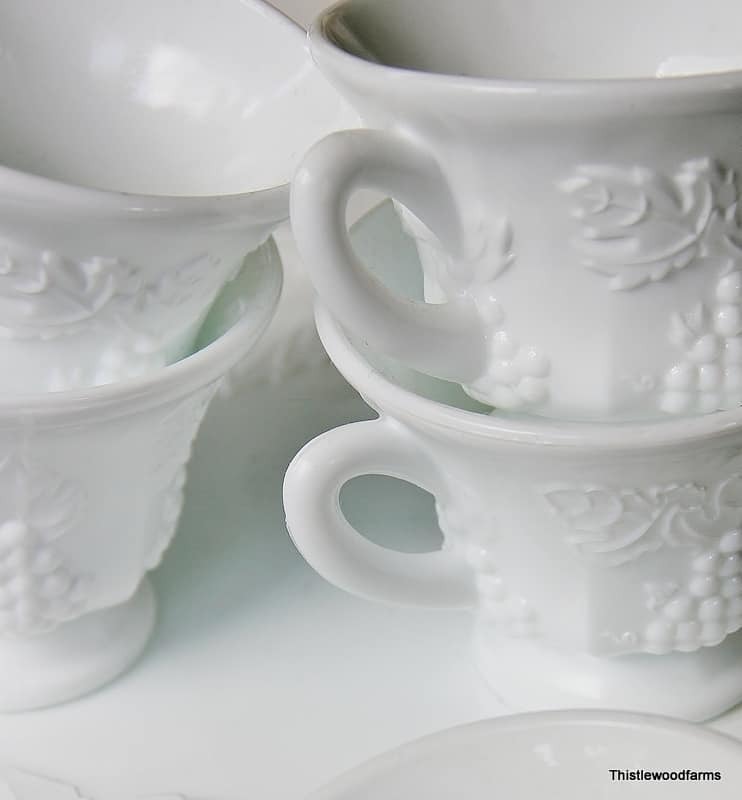 You should use and enjoy your white ware every day. This entry was posted in Hot Collectibles and tagged advice, dÃƒÂ©cor, decorate, decorating ideas, display, how to decorate, how to display, milk glass, modern, porcelain, shabby, Thistlewood Farms, Victorian, vintage, vintage white ware, white, white decor by Flea Market Decor. Bookmark the permalink.